Hypertension is defined as high blood pressure or a long term medical condition in which the arterial blood pressure is continuously elevated. It is also explained as sustained diastolic BP more than 90mmHG accompanied by the elevated systolic BP more than 140mmHg. Diabetes mellitus is a disorder related with a wide variety of disorders in metabolism, the principal feature is hyperglycaemia caused by inadequate insulin action. Azilsartan and Telmisartan are widely used to control hypertension in diabetes patients. This dissertation was designed to assess the efficacy of Azilsartan and Telmisartan. Material and methods: Patients included in this study were diagnosed with Type 2 diabetes mellitus and Hypertension at least age of greater than or equal to 18yrs. 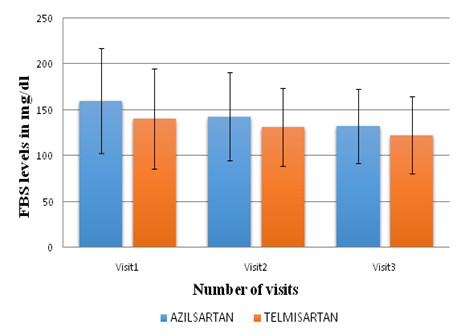 Results: From 305 subjects with diabetes hypertensive patients included in the study, 152 patients received Azilsartan and 153 patients were prescribed with Telmisartan. 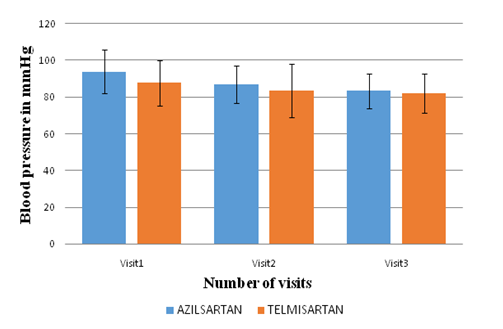 Conclusion: Azilsartan 40mg and Telmisartan 40mg are proved to be efficacious in the patients with hypertension and T2DM, but Azilsartan 40mg has shown more efficacy than Telmisartan 40mg. The aim of our work is to compare Azilsartan and Telmisartan among Type 2 diabetes and hypertensive patients. All subjects diagnosed with Diabetes mellitus Type II and Hypertension with at least age greater than or equal to 18yrs. Before initiation of any study processes oral and written informed consents were obtained and evaluated. Subjects details of demographics and medical history were documented at base line. Prior to the initiation of therapy parameters were assessed from patient’s records. Subjects received the drugs for 24weeks period and returned for final evaluation. Clinical and laboratory parameters include weight, Blood Pressure, Glycosylated Haemoglobin (HbA1c), Post Prandial Blood Glucose (PPBG), Fasting Blood Glucose (FBS), Serum Creatinine and Lipid Profiles. Primary end point was change in blood pressures, HbA1c, FBS, PLBS levels at 3months as compared to the base line values in Azilsartan and Telmisartan groups. The secondary end point was change in lipid profile levels such as serum cholesterol, HDL, LDL, VLDL were measured at 3 months as compared to baseline values. Statistical Analysis: Data was analysed by using graph pad prism software (version5). By using efficacy parameters, laboratory measures and vital signs, Mean and standard deviation were calculated. Difference between quantitative variables was evaluated by using paired t test. Statistical significance was recognised at p<0.05. Figure 1 Changes in systolic blood pressure. Figure 2 Changes in diastolic blood pressure. Figure 3 Changes in fasting blood sugar levels. Figure 4 Changes in post lunch blood sugar levels. Figure 5 Changes in HbA1c levels. 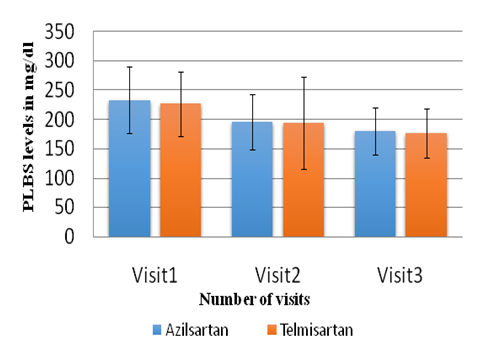 Azilsartan provides greater SBP reduction in subjects with T2DM and Hypertension when compared to Telmisartan. It has expected pleiotropic benefits like improving insulin sensitivity, anti proteinuric effects, anti inflammatory effects, inhibits vascular cell proliferation and endothelial dysfunction and attenuates cardiac remodelling after MI. The results of present study reveal that the all the two groups showed an improvement in hypertension symptoms after 6 months of follow up. All evaluated efficacy parameters showed statistically significant. 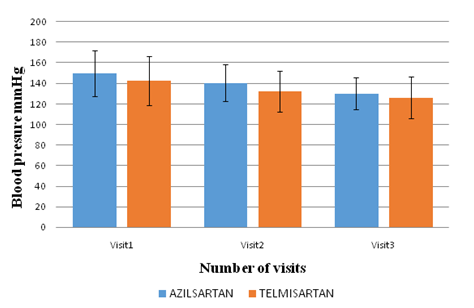 From this study we conclude that both the drugs Azilsartan 40mg and Telmisartan 40mg are proved to be efficacious in the patients with hypertension and T2DM, but Azilsartan 40mg has shown more efficacy than Telmisartan 40mg. Azilsartan 40mg has shown more efficacy in reducing the SBP and DBP levels, blood glucose levels when compared to Telmisartan 40mg. Azilsartan a new Angiotensin receptor blocker has shown superior BP lowering effects when compared with Telmisartan and is well tolerated in patients with Hypertension on the basis of this data we could expect that Azilsartan leads to enhanced BP control in patients with stage I and stage II Hypertension. Our findings represent a substantial improvement over the past but still leaves half of the hypertensive population at risk of cardiovascular events. Further studies must be carried out in order to improve the reliability of this drug, further comparative evidences are required using comparator agents, and increased understanding of pharmacodynamic behaviours of both can be demonstrated excellently. The patients must be educated about measuring BP using semi-automated device by which a permanent record of BP values can be drawn and helps the physician to suggest the doses required and minimise the risk of cardiovascular events in-patients with Hypertension & T2DM. Naish Jeannette. Court, Denise Syndercombe. Medical sciences. 2nd ed. 2006:562‒563. Evans JG, Rose G. Hypertension. Br Med Bull. 1971;27(1):37‒42. Seino Y, Nanjo K, Tajima N, et al. Report of the Committee on the Classification and Diagnostic Criteria of Diabetes Mellitus. J Diabetes Investig. 2010;1(5):212‒228. National diabetes statistics report. National Center for Chronic Disease Prevention and Health Promotion Division of Diabetes Translation. USA; 2014. p. 1‒12. Chobanian AV, Bakris GL, Black HR. Seventh report of the Joint National Committee on Prevention, Detection, Evaluation, and Treatment of High Blood Pressure. Hypertension. 2003;42(6):1206‒1252. Jorge de Faria Maraschin, Nádia Murussi, Vanessa Witter, et al. Diabetes mellitus classification. Arq Bras Cardiol. 2010;95(2):40‒47. Georgiopoulos G, Katsi V, Oikonomou D, et al. Azilsartan as a Potent Antihypertensive Drug with Possible Pleiotropic Cardio metabolic Effects: A Review Study. Front Pharmacol. 2016;7:235. White WB, Cuadra RH, Lloyd E, et al. Effects of Azilsartan medoxomil compared with Olmesartan and Valsartan on ambulatory and clinic blood pressure in patients with type 2diabetes and prediabetis. J Hypertens. 2016;34(4):788‒797. Sica D, White WB, Weber MA, et al. 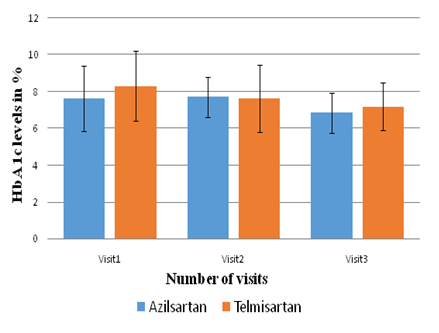 Comparison of the novel angiotensin II receptor blocker: Azilsartan medoxomilvs Valsartan by ambulatory blood pressure monitoring. J Clin Hypertens (Greenwich). 2011;13(7):467‒472. ©2018 Kumar et al. This is an open access article distributed under the terms of the Creative Commons Attribution License , which permits unrestricted use, distribution, and build upon your work non-commercially.